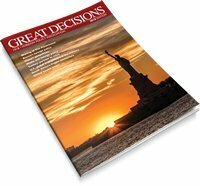 The Great Decisions briefing book features impartial, thought-provoking analyses on eight issues of concern to U.S. policymakers today. Written by carefully selected experts, each article offers policy options for U.S. officials as well as questions and tools for discussion. Topics include: The waning of Pax Americana? Russia's foreign policy, China and America: the new geopolitical equation, Media and foreign policy, Turkey: a partner in crisis, U.S. global engagement and the military, South Africa's fragile democracy, Global health: progress and challenges.